Random case sealers self-adjust to the size of the box / carton being presented to the machine. This makes the random style case sealer a great choice when different size boxes are being used in each production run. Most random style case sealers utilize pneumatics to adjust to the size of the box being presented, therefore an air compressor is needed with most random case sealers. Left and Right driven case sealerCS-05BZ has very good quality and competitive price. It is suitable for light or medium size and weight of cases and it has great cost performance. CS-05BZ case sealer have been widely used in food, pharmaceutical, drink, tobacco, automobile, cable industries etc. More than 10 years design and production experiences, absorbed the world advance technology on case sealer field from Japan, Gemany, Italy etc. According to case size, manual adjust width and height, it is simple, convenient and fast. Sealing cases from top and bottom at the same time, high efficiency. 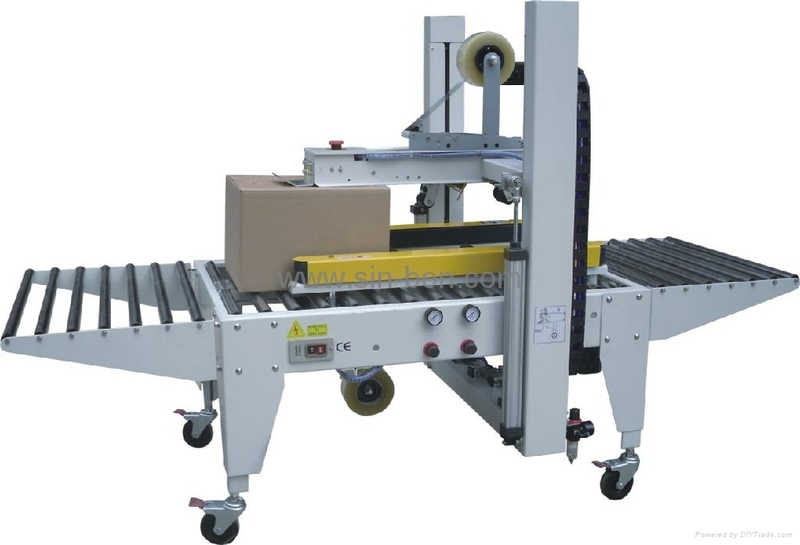 It can work separately and also can work with automatic packaging line.